I slithered down the grassy path and crunched onto the stones at the edge of the beach. The incoming tide lapped and bubbled, while across the water the huge white sand hill gleamed in the fitful sun. No one else on the beach- just the way I like it- as I explored a very different way to visit the Hokianga in Northland, at the top of the North Island in New Zealand. 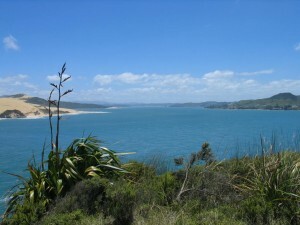 I was on the search for fossils, at the South Head of the long Hokianga Harbour. The guide book led me 100m east along the sand and over some low rocks, to the mouth of a small stream. The fossil-bearing rocks are made of mudstone and sandstone and are covered with another rocky mixture called conglomerate. In this rock, the book said I would find giant foraminifera. I had to study the picture carefully to get my eye in. How cool would it be to find something that is nearly 22 million years old? I glanced from the book, to the muddled surface of the rocks, and back again. It was fascinating that foraminifera are useful for dating rock, and for predicting the presence of oil and gas, but I only wanted to find one for myself. The tide was creeping closer and the rain was threatening, but I kept looking. 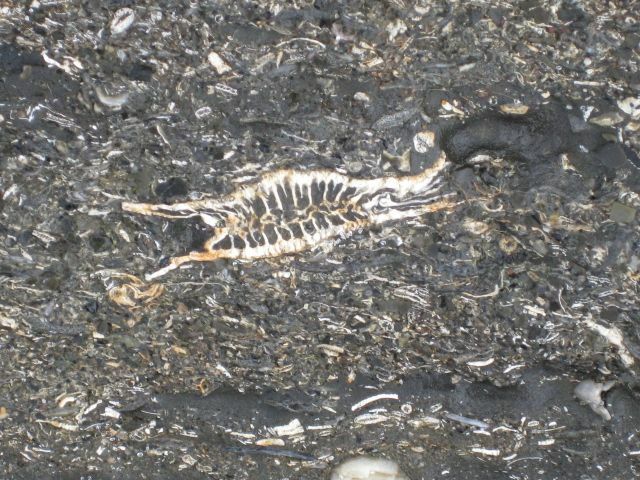 Around me were other rocks, with other fossils and I found some beautiful fish-like skeletons. 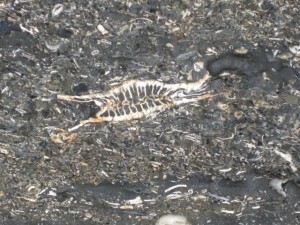 The photo shows the variety of fossils in a section of rock about A4 size. I also found some fossilised barnacles austromegabalanus decorus,. These were about 1.6 million years old and came home with me. I could not find the trophy foraminifera that day, but it was a peaceful and even contemplative way to spend a holiday hour. 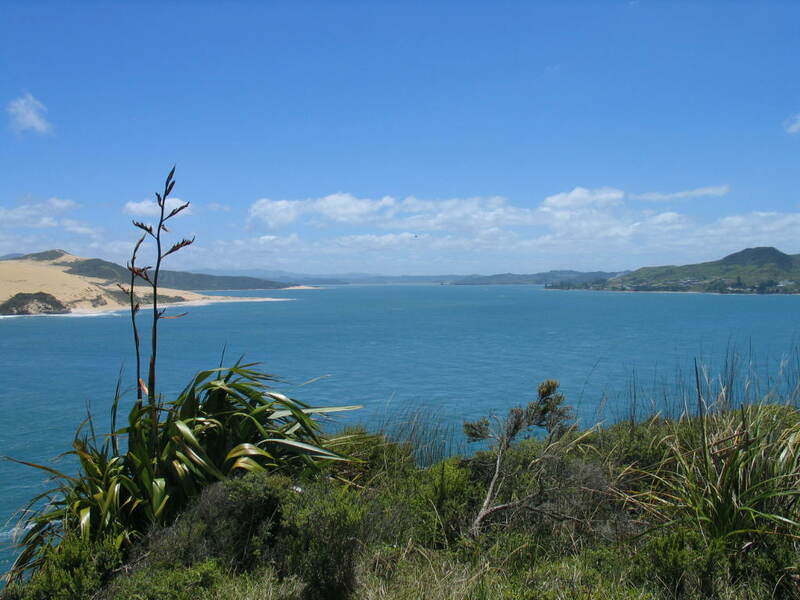 The Hokianga area is famous for its history, for the forest home of giant and ancient kauri, Tane Mahuta, for its natural beauty and quirky villages. Now for me it is home to an elusive fossil, and I shall return with my rock hammer, chisel and goggles and a whole lot more time. by James Crampton and Marianna Terezow, published by Random House $40. Curio Bay right down the bottom of the South Island.